When and where you can collect your studio packages and dancer gifts. When you can access dressing rooms, the lobby, and the theatre. How are award ceremonies run and what can expect. We want people enjoying the experience. We like to provide as much information before the event as possible, so you and your dance families have everything you need. Whether you have attended our Thunderstruck Canada in the past or you are new, we will send out little reminders leading up to and during events to keep everyone informed. This page is a guide and additional resource for studio reference. It has information on Studio Packages and Dancer Gifts, entrance info for dressing rooms and lobby to loading bays and prop load-in. Our awards are pretty fantastic, so a bit about how those work, and what to expect. We announce them after each session to hand out the Adjudication and Overalls. The event culminates with our Flashover Finale and the Eye of the Storm Presentations. There is also information and scoresheets that you can access after the competition. We run a slack channel that provides updates for each event. Studio Directors or representatives that would like access, please let us know, and we'll pull you into the conversation. A mix of Thunderstruck Canada Swag for the director, a copy of the program and your dancer gifts, your studio package will be available in the lobby before the event. If you would like it the day before, please contact the office about picking it up during our load-in. Each year Thunderstruck Canada has a unique gift for every dancer to have as a keepsake. If you are a large studio and would like to have your dancers pick them up, please let us know and we'll be happy to do that for you. Information about the dressing rooms for each event are available from the respective event page. In general, they open one (1) hour before the competition starts. Dancers should remove their costumes after each session and ensure to leave the space in the same condition as it was found. We also publish specific information about props, loading bays or areas, load-in times and expectations. Only props that have been declared will be allowed on stage. If you have declared props, you will also receive additional information or requests by email to make sure that aspect flows smoothly for the dads. Admission to the majority of our regional events is free. Specific venues have Theatre Improvement Fees (TIFs) that are charged based on the number of patrons that use the facility. In these instances, rather than ticket an event we'll charge a one-time dancer fee. This information will be available on the General Schedule page for each competition. House Rules must be respected. Those who chose to disregard these rules will be invited to leave the theatre. Patrons are invited to watch master classes, but the same rules apply. Those interested in socialising are encouraged to do so in the lobby. We host award ceremonies after each session. Typically, Petite and Juniors will compete in the morning sessions, and teens and seniors in the afternoon/evening sessions. We start with each of our adjudicators handing out their Judge's Choice Award followed by our Adjudications and Overalls. One dancer from each routine will be asked to accept their adjudication plaque, one of ten (10) distinct and new designs each year on stage. Following the Adjudications, we announce our Top Ten (10) Overalls. Again, we ask that one dancer represent the routine to be recognised. Each performance receives a trophy whose designs match the plaques. Dancers in the Top Ten (10) each get crazy bands and those in the Top Three (3) also get a ribbon. 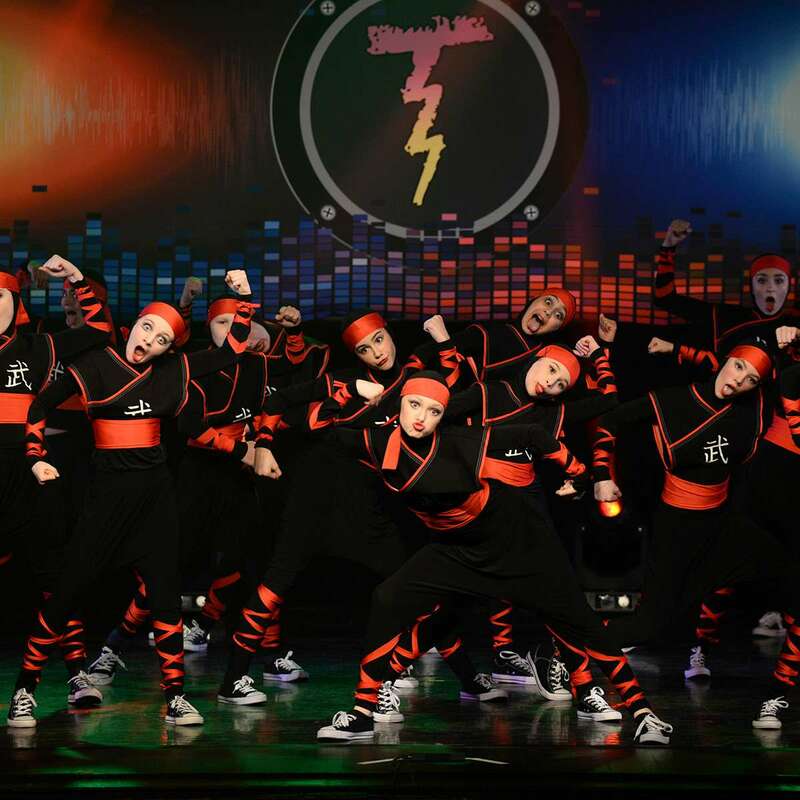 Our Eye of the Storm Presentations is at the end of the event following the Flashover Finale, which is the culmination of our Thunderbolt Solo category, the Top Group Routine Battle and the Positive Flash Gala. They represent all our special awards. This session will start with the regular awards from the routines that danced and then jump into these presentations. We determine the Top Group Routine through a battle as part of the Flashover Finale. The Top Three (3) Groups from each Age & Performance Division qualify, this list will be updated during the awards sessions and posted online. The Gala is also part of the Flashover Finale where we invite some of the favourite routines from the event with a #ChanceToDance for the fun and art of performing and audience enjoyment. It does not impact the competition. Video Adjudication and Scores are available online from the studio account to download and share. Video files are archived each fall, so if you want copies, you are encouraged to download them. Scores remain available in the database.